The Futures wines made in the 1980’s and 1990’s represented great buying value and ageing potential. Made for sale as one year old wines, and offered for sale in advance of bottling, the wine buyer received 5 cases of wines while only paying for three cases. This enable the consumer to have enough in stock to be able to start drinking it straightaway, and then being regularly able to try the wine, while still having enough to age and try as an aged wine. The wines were great early drinking, but responded with good cellaring to 10 to 15 years ageing. A selection of Futures information including various Vertical Tastings. Three generations of Haselgroves and red wine. Ron Haselgrove OBE born in 1900 spent all his working life with the love of wine. His famous reds from the ‘50’s thru’ to the ‘70’s included the famous Mildara Bin Series of reds blended from the then little known regions of Coonawarra, McLaren Vale and Hunter Valley. And in 1963 he made the first Mildara Coonawarra Cabernet Sauvignon which became famously known as “Peppermint Patty” due to its characteristic aroma; and its sheer quality which led it to become known as one of Australia’s Icon wines. James, Ron’s second son born in 1943, worked at Mildara Coonawarra in the ‘70’s under the tutelage of Ron, and learnt the craft of making fine red wine. Knowing Ron’s love of the McLaren Vale wine region, in the early ‘80’s James moved to McLaren Vale with family in tow. And what better area than McLaren Vale to produce a wine to follow the ground breaking Mildara reds. James set about making a big red, full of flavour and fruit but in careful balance with wood maturation in small oak. And to make it affordable to all, the concept of the Futures Shiraz was born. It was both a wine for the future – designed to age many years, but also an en primeur payment system made the wine available for dedicated wine drinkers to buy the wine in advance of bottling, first bottling was in 1981. Nick, James’ son has had a love of wine, since his early years. Born in 1967, he made his first wine, with help of Dad in 1971, a Coonawarra Gewurtstraminer, only a few dozen, but it stood the test and was more than drinkable some years after. Nick attended Roseworthy College and studied Oenology and graduated in 1990, and started his wine career with James Haselgrove Wines. 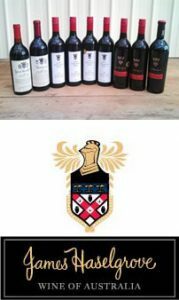 In that year he took on the responsibility for making the Futures Shiraz and in 1993 won the title of McLaren Vale Bushing King with the 1992 wine – the best wine in the McLaren Vale Wine Show. New owners of the business took over in 1992, and the Futures concept didn’t continue beyond 1994 under the new proprietors. In 2004 James and Nick decided to restore the James Haselgrove Futures wine to the Haselgrove family company’s portfolio and set about making a 2005 Futures Shiraz, the 17th Release made from McLaren Vale sourced fruit. Previous buyers of the Futures we thrilled to see the return of the wine. Each year since, the wine having been already made, has been offered to our client list in advance of the bottling. The 24th wine (maturing in oak barrels) is currently being offered, and James and Nick want to expand the list of those who love their big red Shiraz and want some in their cellar. Only the best grapes and winemaking practices are used to produce the James Haselgrove Futures wine. Here’s a history of our Futures Shiraz from 1989 thru’ to 2016.